oooh my kinnies gonna love this I think. Last edited by daimon : 09-16-2010 at 07:03 PM. 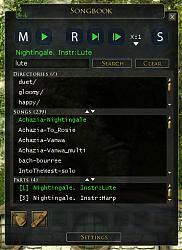 ...of the Rings Online\Plugins\Chiran\Songbook\Main.lua:4: Unable to resolve package "Turbine.Debug". Wonderful idea for the addon, so if you have any hints as to what might be causing this would be great. This is what the music system has always needed. I can't wait to try this out, and look forward to other developments/improvements! Thanks for the good suggestions! I was also planning to have /sync support but the other ones I have to add to my list . The vbs script that generates the library database doesn't support Windows XP or 2000 at the moment. I will update it. Each time I run the vbs file it says that I only have 1 abc file, and I actually have about 20. 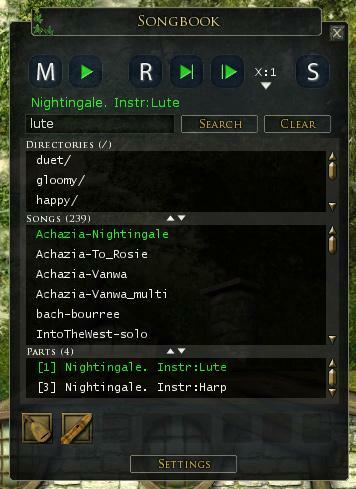 It also never updates the list on the plugin in game. What might I be doing wrong? Does this script work better for you? I updated it to support Windows XP and to be more vocal if it can't find something. I haven't updated this yet to the released version as I plan to add something else as well. I'll have to test the script when I get home. I'm currently running Windows 7 64bit. Does it matter I've remapped my Documents folder to another drive? This is where all teh LOTRO stuff would live. Oh yes, that could be a problem as I look for the documents folder under user's home directory. But obviously it's not there then. I'm not sure how to find it if it has been moved. I have to look into that. Or I just have to make it configurable then. A good find nevertheless, thanks! Hi, this plugin sounds very good although I tried this and also Lotropad and they both are unable to be loaded. They are both recognised in-game (/plugins refresh) but won't load. Would this cause problems with the plugins loading? The vba script worked successfully (it found all the abc files I have, the correct number) but when I go in-game the two plugins are recognised but won't load. Any suggestions? Hm, I'm not exactly sure what the problem is. Do other plugins work, have you downloaded Turbine plugin classes? Is there an error message? Thanks for the quick response, Chiran. I believe the fault is with me somehow... I get no error message at all in-game; it simply says 'Unable to load <plugin name>'. I just registered today (a friend told me of this site) so really I have not tried other plugins yet, to be honest. However I have not downloaded "Turbine plugin classes"; I have no idea in fact what they are; I simply followed the instructions of the FAQ on how to install plugins and your own instructions for your plugins. I had the same issue and it was the turbine plugin classes were missing and needed to be there. Last edited by Balgosa : 09-17-2010 at 05:05 PM.